PRDH-IGD.com and GenealogyQuebec.com are genealogical research websites managed by the Drouin genealogical Institute. 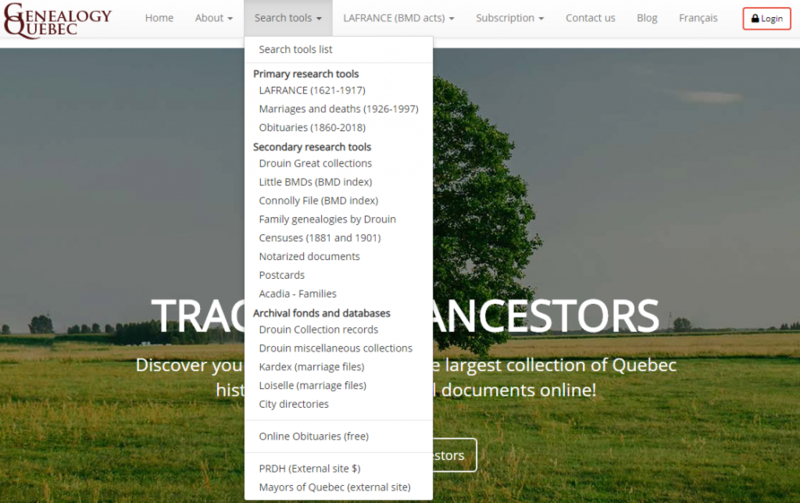 Genealogy Quebec contains all of the genealogical data, collections and tools developed and acquired by the Drouin Institute over the past 100 years. You will find on the website over 44 million images and files distributed through 16 different tools and collections. You will find more detailed information about these 16 tools here, and about the website in general at this address. 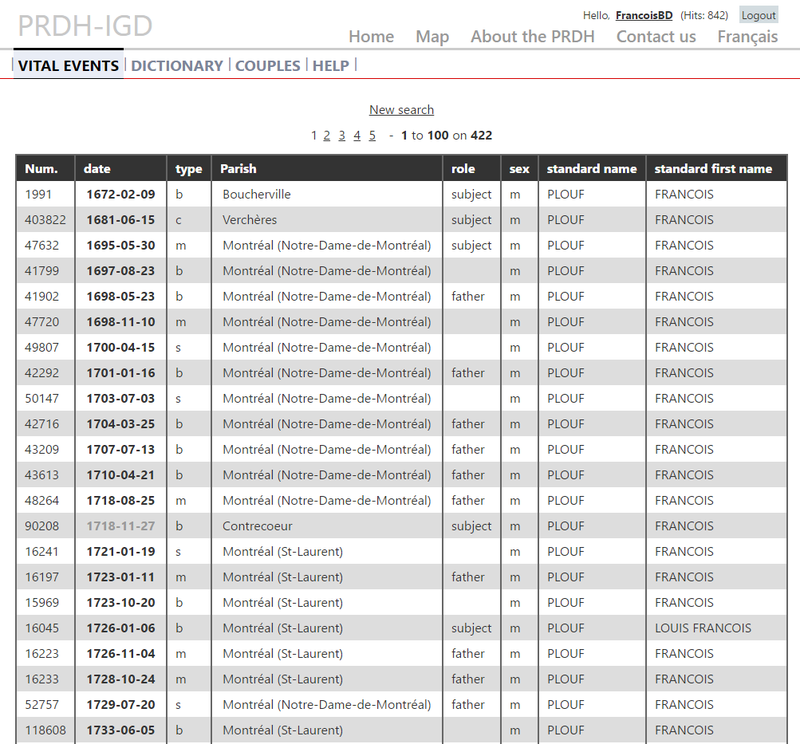 The PRDH-IGD was created from a Université de Montréal database and is in constant evolution. You will find more information about the PRDH-IGD and its content in this article. What are the differences between PRDH-IGD.com and GenealogyQuebec.com? What are the advantages of being subscribed to both websites, and how do the subscriptions interact? Note that a delay of a few days is to be expected before the reception of your bonus hits as we need to treat your demand manually. 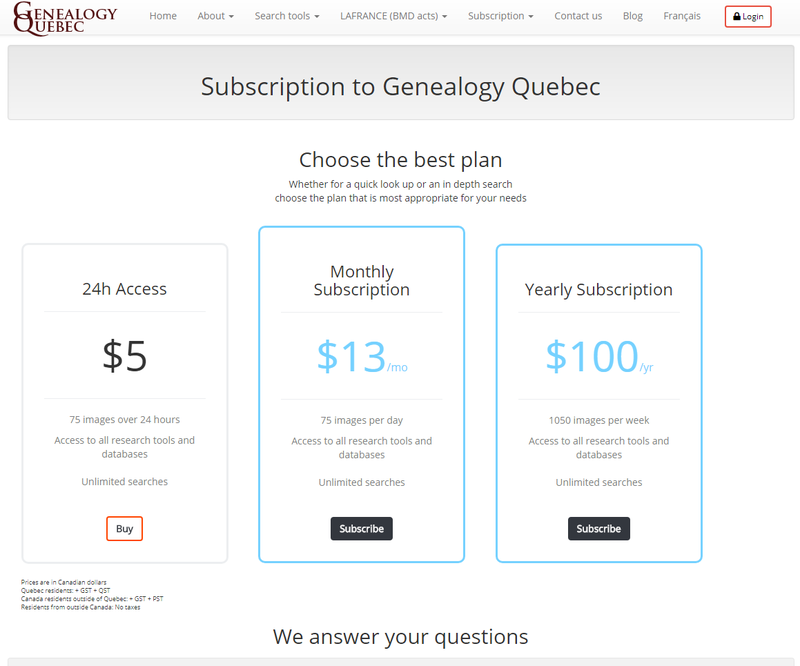 This guide will provide you with detailed instructions which will help you establish your ancestry and find your ancestors using the tools available on Genealogy Quebec. Examples of the challenges you may encounter while establishing your ancestry are used throughout the guide. Your ancestry denotes all of your ancestors as far back as they are traceable, starting with your parents. With each generation, the amount of ancestors you have doubles: 2 parents, 4 grandparents, 8 great grandparents, etc. Patrilineal (father, grandfather, great grandfather, etc.) or matrilineal (mother, grandmother, great grandmother, etc.) An ancestry can be unlimited, going as far back as the genealogical sources allow, or limited to a certain amount of generations. The key to establishing an ancestry is the marriage record. Most marriage records will contain the name of the spouses’ parents or the name of the previous spouse, which are necessary in order to trace back an ancestry. 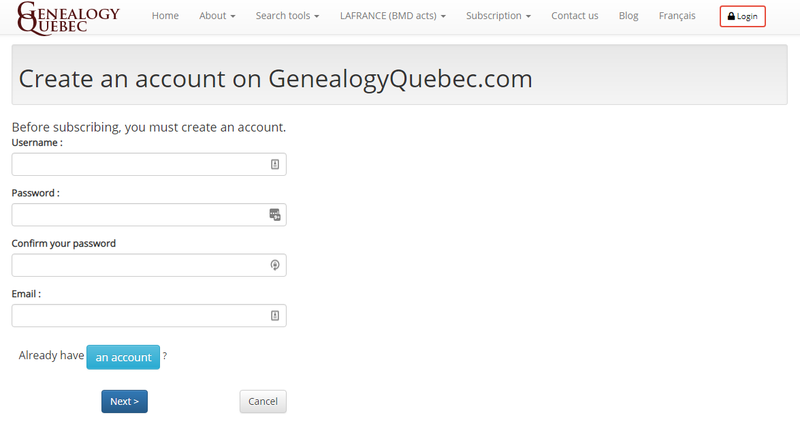 Genealogy Quebec offers a multitude of complementary genealogical tools which you will need to find your ancestors. 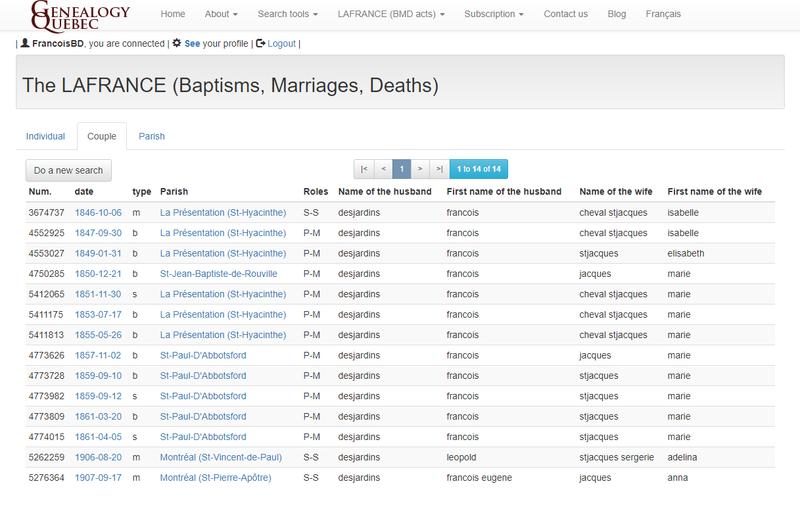 The LAFRANCE, which contains, among other things, all the Catholic marriages from Quebec between 1621 and 1916. Thanks to a refined search engine, you will be able to search without worrying about the different variations of a specific name. A link to the original document is included with every record. It is through the LAFRANCE that you will establish the majority of your ancestry. You can browse the LAFRANCE here (subscription required). The Men and Women series and the Kardex are marriage directories covering a period that goes up to 1940. These directories will be the bridge between your starting point and the first LAFRANCE marriage (in other words, the first pre-1917 marriage) of your ancestry. You can browse the Men and Women series here, and the Kardex at this address. (subscription required). The 1926 – 1997 marriage index, with a link to the original record included in every document. 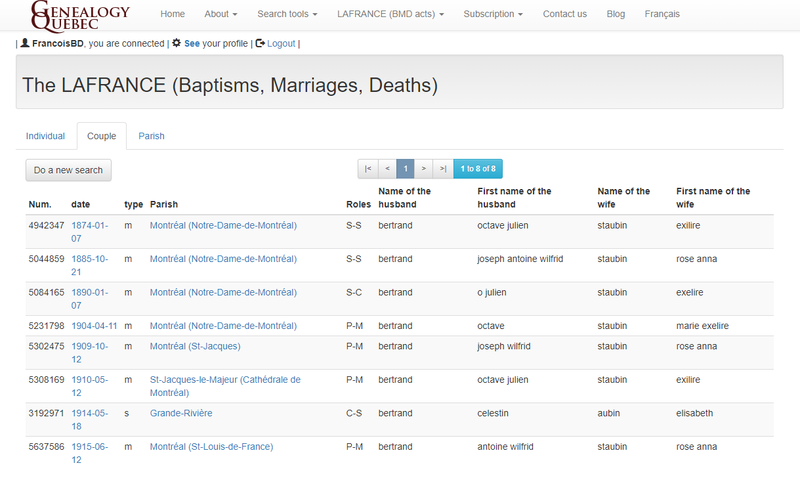 You can browse the Marriages and deaths 1926-1997 tool here (subscription required). 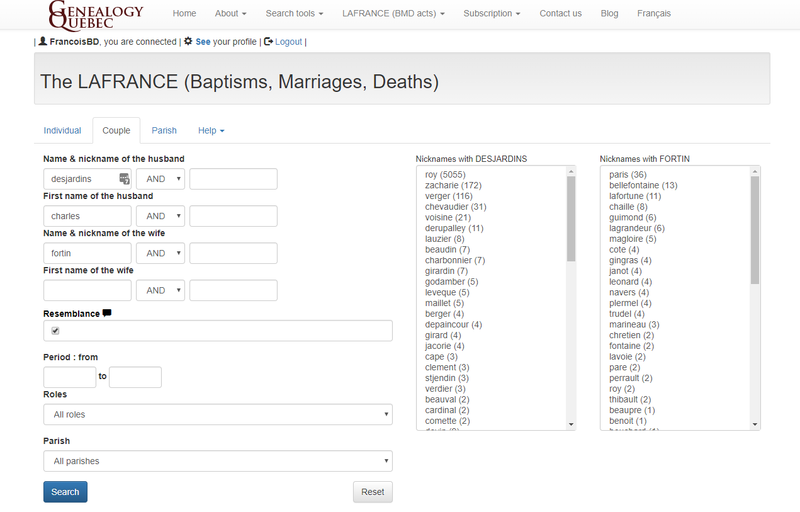 Finding your ancestors using the LAFRANCE is easy once you find a marriage that predates 1917. The real challenge is to find that marriage. 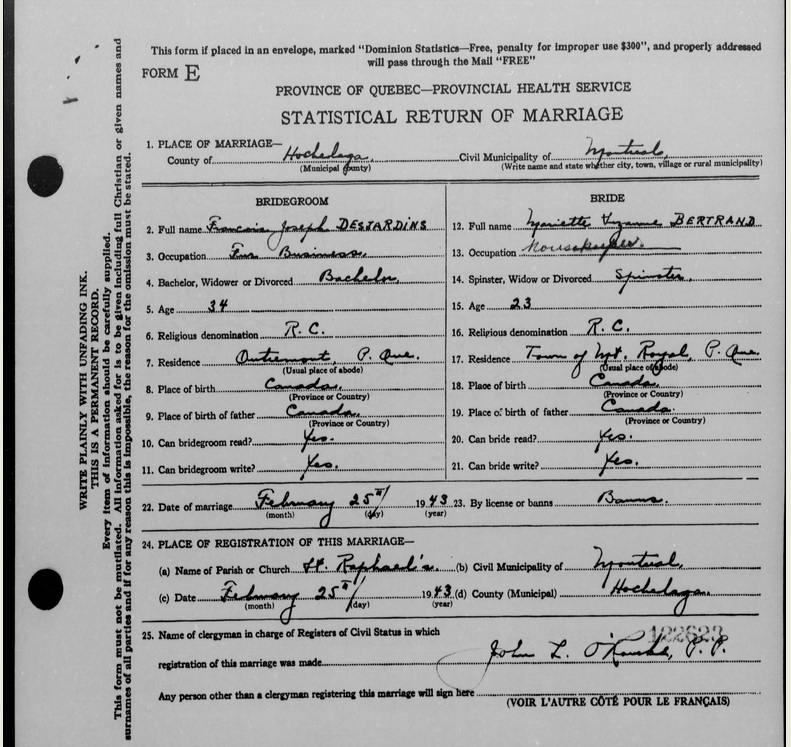 When establishing your ancestry on Genealogy Quebec, your initial objective is to find a marriage that predates 1917. You will be able to do so by using our Marriage 1926-1997, Men series, Women series and Kardex tools. The ancestry of Bertrand Desjardins, born on the 24th of November 1948 in Montreal, will serve as our example throughout this guide. To find your ancestors using Genealogy Quebec, you must begin by establishing all the information you have on your family. It is always a good idea to ask parents, grandparents and other family members for clues and information regarding the family. The more information you start with, the easier your research will be. Make sure to have all this information readily available when starting your research. Here is the information established by Bertrand before the start of his research. François-Joseph Desjardins born in 1908, died on the 1st of September 1963 and Suzanne Bertrand, born in 1919, died on December 31st 2014, married in 1943 in Montreal. François-Joseph Desjardins’ parents: François Desjardins, died in July 1955 and Anna Jacques, died on September 1st 1975. Suzanne Bertrand’ parents: Émile Bertrand, died on the 4th of November 1961 and Irène Michaud, died in june 1942. François-Joseph is the eldest child of his family; Suzanne is the second child. François Desjardins’ father is Charles Desjardins. It is now time to use the information we’ve gathered in the first step. First of all, we must verify whether this information allows us to track down a marriage that predates the year 1917. 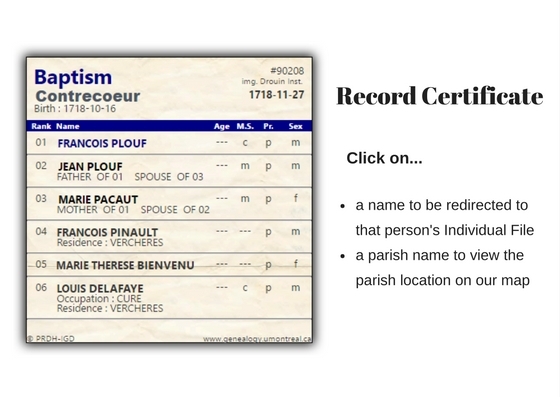 If that is the case, a simple search for the wife and husband’s names in the LAFRANCE should allow us to find the marriage record. If that is not the case, we will have to turn to the complementary tools. Using your notes, try to find the earliest marriage you can get your hands on. This marriage will be your starting point. If this marriage took place between 1917 and 1940, use the Men and Women series and the Kardex for your research. Let’s go back to Bertrand Desjardins’ attempt at discovering his ancestors using the Genealogy Quebec website. It is now time for Bertrand to put the information gathered during the previous step of his research to use. The first thing Bertrand notices is that his father, François-Joseph Desjardins, was born in 1908. This signifies that François-Joseph’s parents, François Desjardins and Anna Jacques, were married in 1908 at the latest; children born out of wedlock were a rarity at the time. 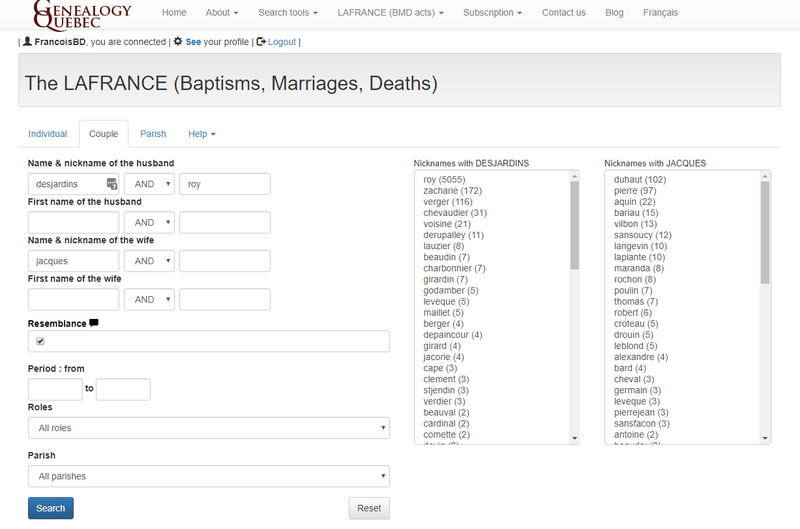 A simple search for their names in the LAFRANCE should lead to their marriage. Search for the marriage of a Desjardins with a Jacques in the LAFRANCE. Results from the previous search. The result we’re interested in is the last in the list. Within minutes, Bertrand was able to find the first LAFRANCE mariage of his paternal ancestry. The marriage record indicates that François Desjardins’ parents are Charles Eugène Desjardins and Marie Malvina Fortin. A search in the LAFRANCE should allow us to find their marriage. Search results from the previous search. The first result is the one we are interested in. 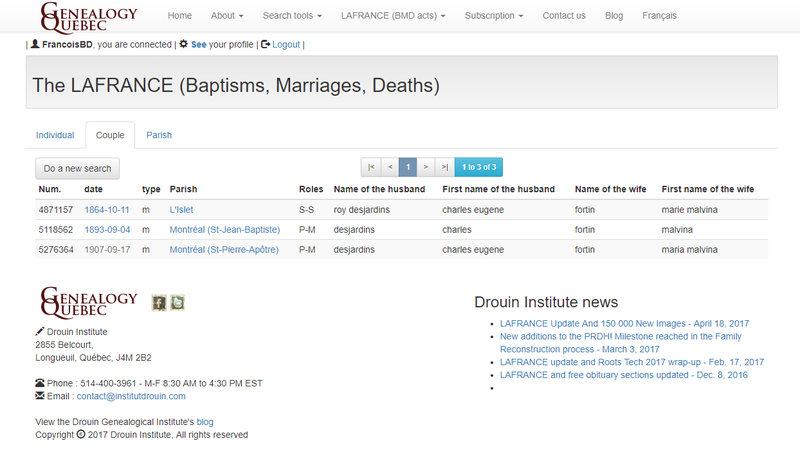 The marriage record tells us that Charles Eugène Desjardins’ parents are Alexandre Roy Desjardins and Léocadie Gagnon. From this point on, it is simply about repeating the process of searching for the parents’ marriage until we reach the first immigrant of the lineage. In Bertrand’s case, the first immigrant is Alexandre Roy dit Desjardins, who married Marie Major on the 11th of September 1668 in Québec city. 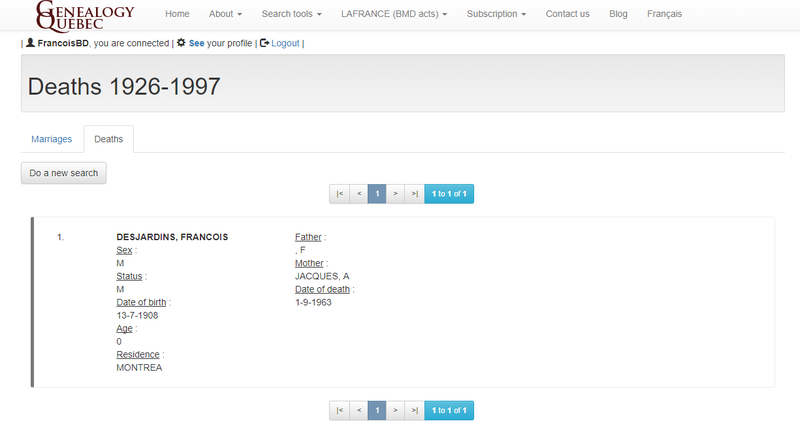 Bertrand Desjardins’ paternal ancestry is completed within minutes thanks to the LAFRANCE. All that is left now is the presentation of this work. There are several templates available on the internet to organize and present your ancestry. His paternal ancestry completed, Bertrand decides to tackle the maternal side of his family. This time, there is no way to know if Bertrand’s grandparents’ marriage was celebrated before 1917. A LAFRANCE search for Émile Bertrand and Irène Michaud yields no results. Bertrand must now turn to the Drouin Great Collections; the Men and Women series and the Kardex. 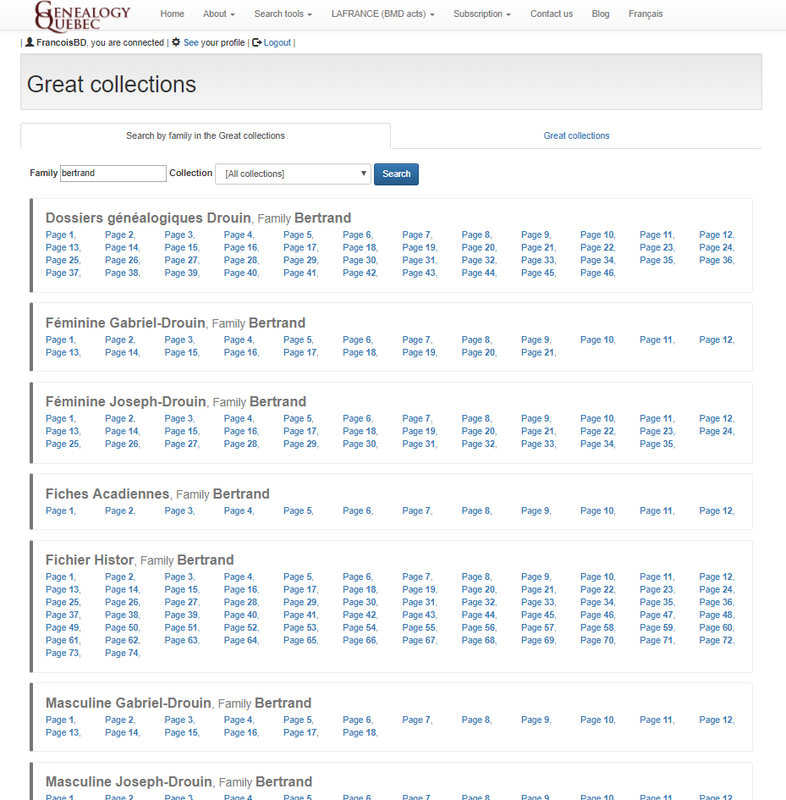 To use the Men and Women series, head over to the Drouin Institute’s Great Collections category and click on “Search by family in the Great collections”. The search is done by family name. The results are separated by tools and are ordered in alphabetical order of the subject’s first name. As a result, an Albert would be found on the first few pages in the results. A Zenophile would be on the last page. Note that it is possible for an individual to be sorted by his secondary first name. Émile could be sorted under Joseph Émile, since there is no distinction between the primary and the secondary first name. Similarly, a woman could be sorted under Marie despite usually being known under a different name. Searches for the surnames Bertrand in the Men Series and Michaud in the Women Series produced no relevant results. The Kardex is next. The Kardex must be navigated manually, as it doesn’t come with a built in search engine. The files are sorted by letter and by the name of the husband. 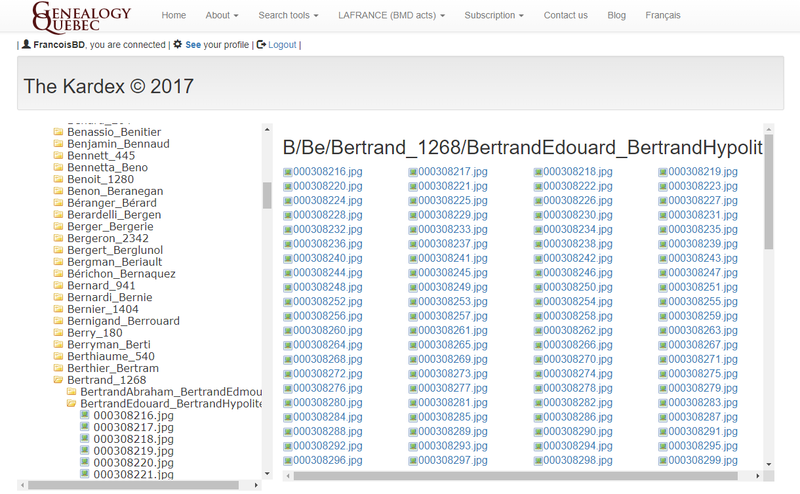 Since we are looking for Émile Bertrand’s marriage, we have opened the BertrandEdouard – BertrandHypolite folder. 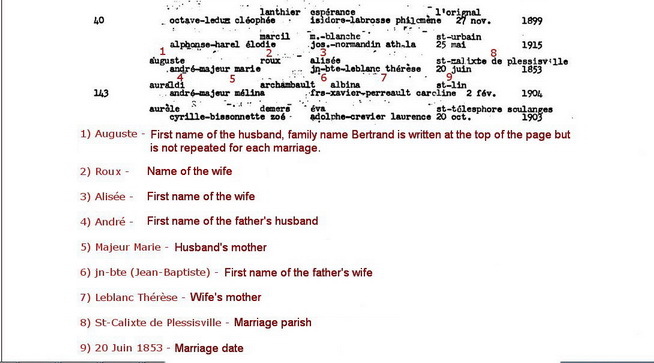 The first file will contain the marriage of an Edouard Bertrand. 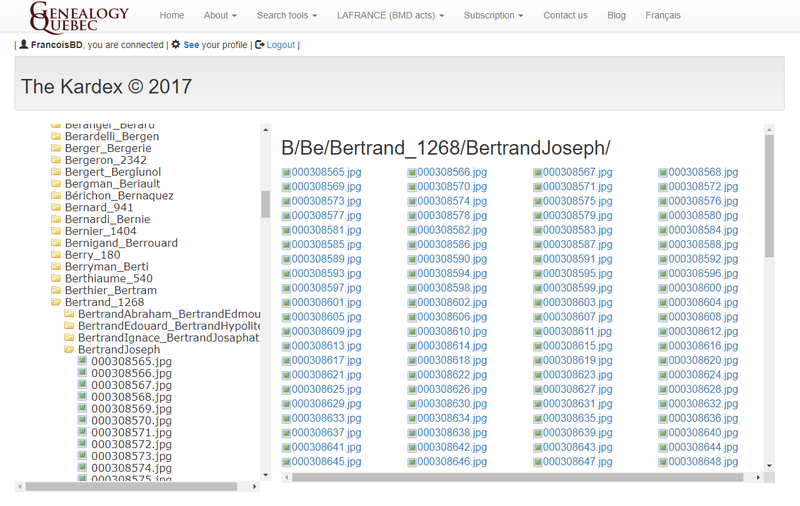 Seeing as the files are ordered in alphabetical order of the husband’s first name, Émile Bertrand’s file should be among the first ones. Unfortunately, the file isn’t in this folder. As mentioned earlier, it is possible that Émile could be identified as Joseph Émile in his marriage file. To verify this possibility, we must look into the BertrandJoseph folder. Note that the files are first sorted by the man’s first forename, and then by the woman’s surname. The marriage file of a Joseph Émile and a Michaud will be found at Michaud and not at Émile. 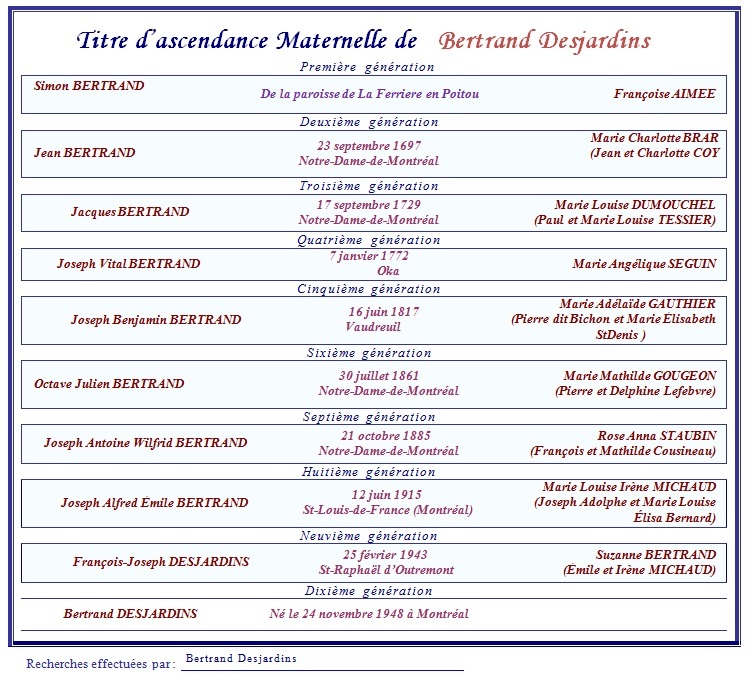 The file was in fact in the BertrandJoseph folder, sorted by Michaud. 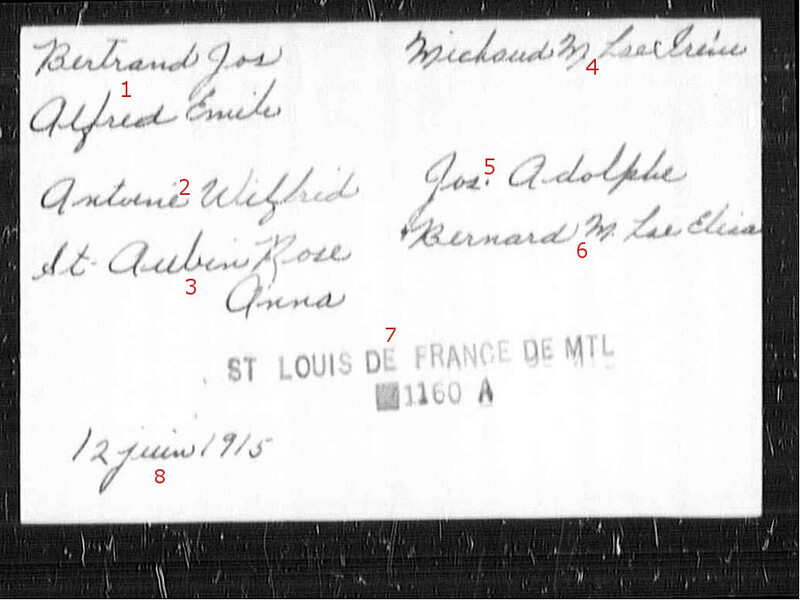 We now know that Émile’s parents are named Antoine Wilfrid Bertrand and Rose Anne St-Aubin. We should be able to find their marriage in the LAFRANCE. The next step is to find Antoine Wilfrid Bertrand’s parents’ marriage in the LAFRANCE, and to follow the paternal lineage all the way up to the first immigrant. This first immigrant is Jean Bertrand, who married Marie Charlotte Brar on the 23rd of September 1697 in Montreal. Bertrand’s maternal ancestry is completed. In the world of genealogical research, it is often necessary to call upon one’s inner detective. Sometimes, the usual procedure doesn’t lead to the desired results. In those cases, a certain amount of creativity and initiative is necessary to pull through. For a good example of that, let’s go back to Bertrand Desjardins’ paternal ancestry. Bertrand had no difficulty finding his grand-father’s marriage in the LAFRANCE thanks to the information established at the start of his research. Let’s now imagine a scenario where Bertrand’s initial gathering of information did not allow him to find his grand-parents’ names. Essentially, Bertrand’s starting point is now his own parents and the only information available to him is his parents’ marriage date, their dates of birth and the date of death of his father. Since marriages don’t go past 1916 in the LAFRANCE and 1940 in the Great Collections, Bertrand has to turn to the Marriages and Deaths 1926-1997 tool. 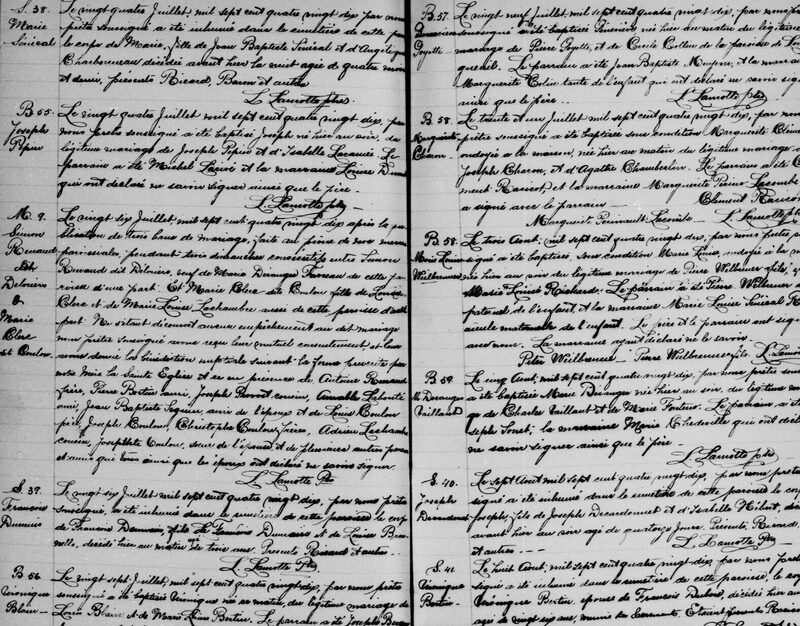 While this document provides us with tons of interesting information, it doesn’t help us find Bertrand’s grand-parents’ marriage, as they aren’t mentioned in the record. This is when some initiative and creativity is required to push the research further. We know François Joseph Desjardins died on the 1st of September 1963. 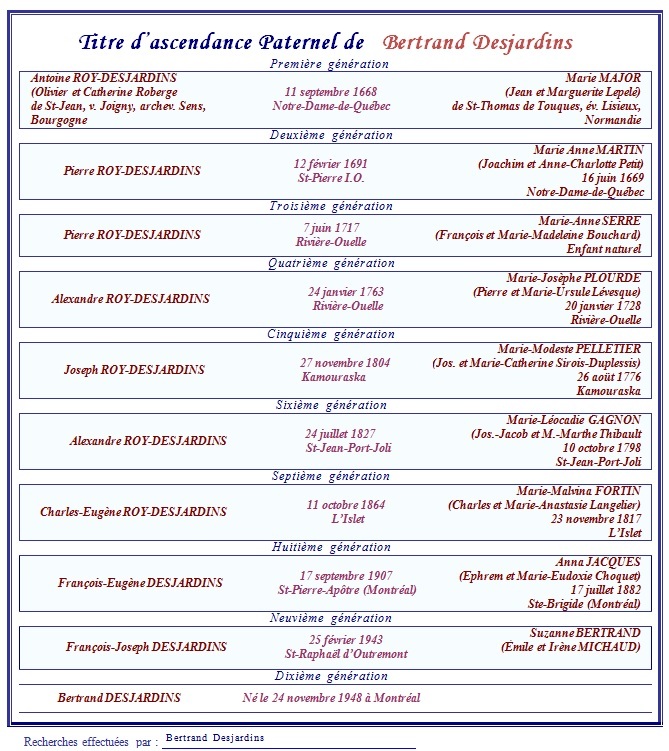 Still in the Marriage and Deaths 1926-1997 tool, but this time in the Death 1926-1997 section, let’s attempt to find François Joseph’s death record. We are able to find his death record. Luckily, the file indicates that the mother’s name is JACQUES, A. and that the father’s name is DESJARDINS, F. A search for a Desjardins/Jacques couple in the LAFRANCE will allow us to find their marriage, and to trace back Bertrand’s paternal ancestry. The instructions and examples given in this guide will cover most of the situations you will encounter when establishing your ancestry on Genealogy Quebec. Do not hesitate to contact us at contact @ institutdrouin.com if you have any questions regarding this guide or the process of retracing your ancestors. 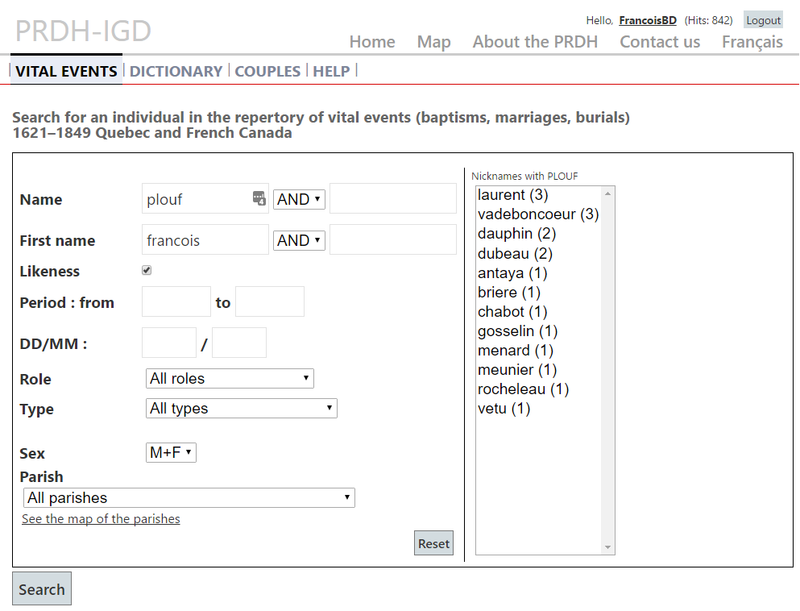 The PRDH-IGD is a directory of ALL vital events (baptisms, marriages and burials) celebrated by the Catholic church in Quebec and French Canada from 1621 to 1849, as well as a genealogical dictionary of families (Family Reconstructions). The PRDH-IGD database contains over 2 500 000 records. What makes the PRDH-IGD unique is how these records are connected to one another through genealogical links, which we refer to as Family Reconstructions. In addition to the baptism, marriage and burial files, the PRDH-IGD contains individual and family files. Any individual mentioned in a BMD record from the database is given an individual file. Similarly, any married couple mentioned in a BMD record gets their own family file. To better understand the importance and value of family reconstructions, we will explore the database by using the example of François Plouf, who lived in St-François-Xavier-de-Verchères in the 18th century. To begin the search, the information is entered in the search template. In this case, we are searching for any mention of a Francois Plouf in the database, without limiting the search to a specific period or parish. We obtain a list of results for our search. We will select the 14th result, which is the baptism of François Plouf, celebrated on the 27th of November 1718 in Contrecoeur. This baptism file was created from the original record. It extracts all the relevant information from it and presents it in a convenient manner. In a PRDH-IGD baptism, marriage or burial file, every name is a link to that person’s individual file. By clicking on François Plouf’s name, we are taken to the following file. 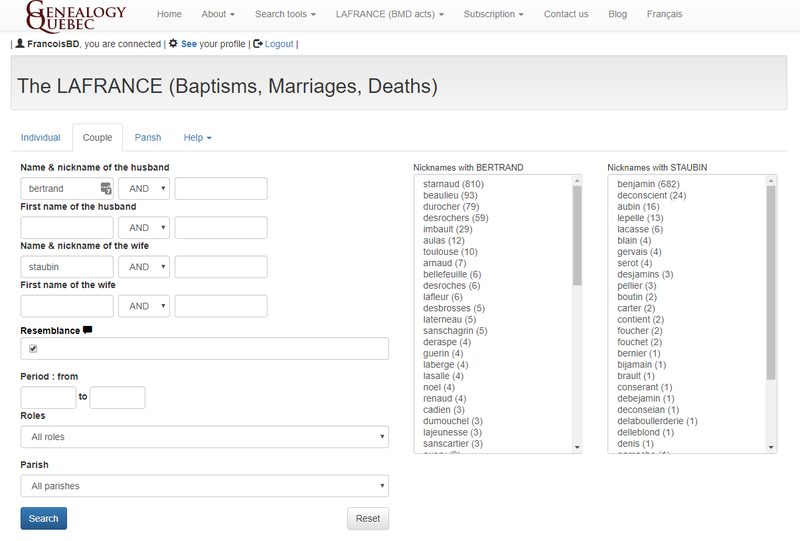 The individual file centralizes all of the mentions of an individual in the database, such as the person’s baptism, burial and marriage. The individual file also mentions the parents as well as the spouse(s). Again, every name is also a link to that person’s individual file. Additionally, written dates can be clicked to be taken to that event’s certificate. Finally, the “First marriage” and “Family” mentions link to the appropriate family file. 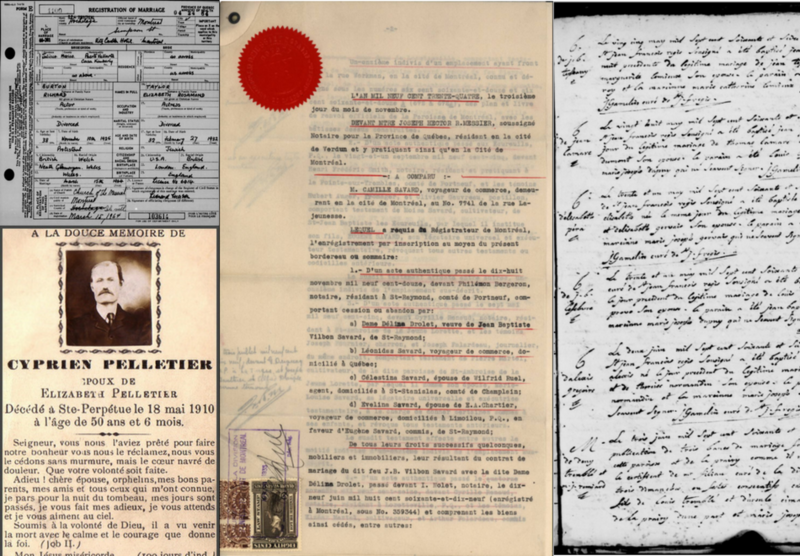 Let’s explore François Plouf and Marie Ursule emery Codere’s family file. A family file is created for any married couple mentioned in a record certificate in the database. This family file centralizes all the information available on the couple as well as all of their children, and provides links to the individual files and record certificates that pertain to the family. The family file can be seen as the final result of the PRDH’s family reconstruction process. Ultimately, the PRDH-IGD database can be described as a massive family tree of all Catholic individuals who lived in Quebec between 1621 and 1849. The database is being corrected and added to on a monthly basis, and we hope to be able to extend the period it covers shortly. What are the differences between the PRDH-IGD.com and GenealogyQuebec.com? 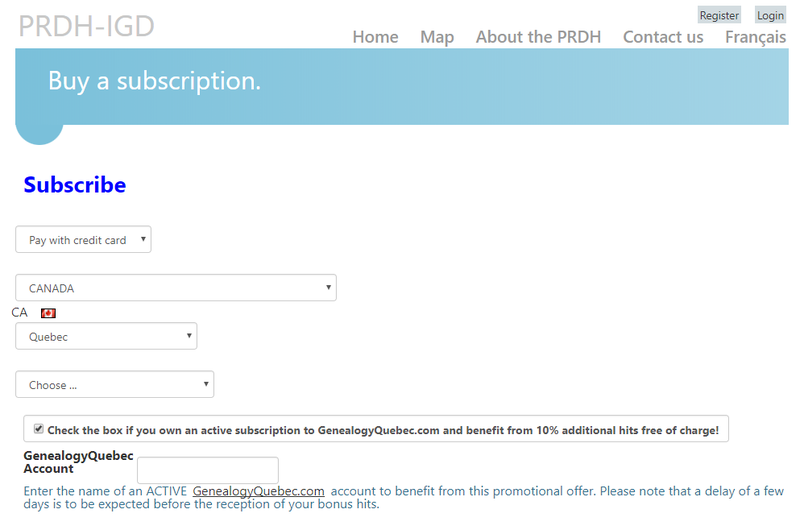 How to subscribe to the PRDH-IGD? PRDH-IGD subscriptions are hit based. A hit is charged each time a page is displayed, except for the list of references obtained from a query, which is not charged. A subscription thus corresponds to the right to view a certain quantity of one or the other of the following elements: a certificate from the Repertory of vital events (record certificates), an individual or family file from the Genealogical dictionary or a couples’ file with their married children from the Repertory of couples. You will find the various subscription options at this address.